We all love swag but I think it’s safe to say we all love different/weird swag. 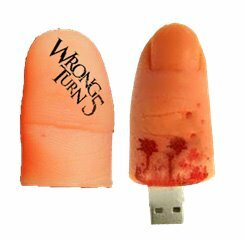 That’s why I think it’s awesome that “Wrong Turn 5” will be handing out 1,500 special edition Thumb Drives. FearNET shared the news today about this truly one of a kind item. How do you get one? Well, there’s two ways. As with most items, this is a first come/first serve. If this is something you really want, be sure to hop on it right away. I can see this one going fast!